Do you have an ‘ōhi‘atree? Do you live in Hawaii? If so, you may want to keep a close eye on your tree, for the Agricultural Research Service (ARS) and university scientists have identified two new species of fungi as the killer of hundreds of thousands of the beloved Hawaii ‘Ōhi‘a trees. Rapid 'Ōhi'a Death” (ROD) is a wilt disease. Up until now, the disease has been limited to the Big Island of Hawaii but is now in Kauai. The ‘ōhi‘a tree is a native species to Hawaiian forests, and plays a critical role in the ecosystem. The tree helps maintain watershed health, groundwater quality, and provides a habitat for rare and endangered birds and insects. Federal, state and other cooperators are researching tirelessly on how to contain and manage the disease. 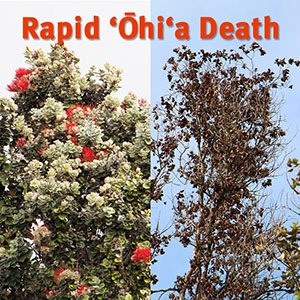 The name of the disease; “Rapid 'Ōhi'a Death,” refers to the fact that once visible symptoms occur, the trees most likely only have a few weeks to live. With that being said, affected trees can actually have the fungi for months before any of the disease symptoms start showing. The team identified the two fungi using “specimens” from dead or dying ‘ōhi‘a trees. So, researchers are now trying to develop fast new methods of detecting the fungi. This will increase efforts to monitor the disease and prevent its spread to other Hawaiian Islands as well as other regions of the world.